Who Is Getting Relegated From The Premier League? 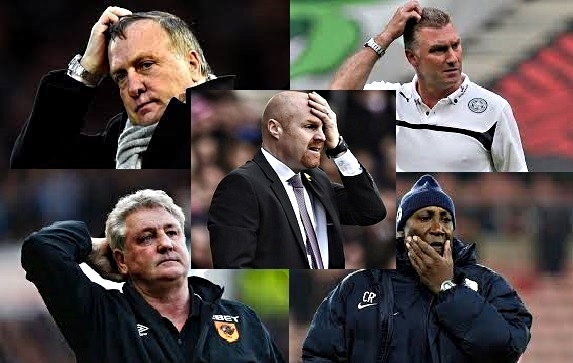 Relegation battles have destroyed many a prediction over the years. I condemned Sunderland at a similar point last season only for them to pull off a series of unlikely results to ensure survival and Wigan’s repeated travails under Martinez prior to their eventual demise will have tested the most hardy cynic. It’s tough to know how a team will respond as the spectre of impending relegation flickers ever more visibly in the corner of their sight but we do know a few things about them, namely: what they’ve done up until this juncture. Typically, team media narratives can get a little entrenched by this point in the season and without a stand-out terrible team this year, at least in terms of the vital metric of “points gained”, we are left with trap-door slightly ajar but as yet lacking sufficient pressure to force open. But who is toast? Who deserves nothing? There are bad teams in the league, for sure, and we’re going to take a look at how bad they have been and what chance they have of recovering. Reality: Are bottom, struggle to score, have won twice in 2015. Fixtures: Three against rivals, two against holidaying teams and none against the top seven. So, they’ve got a shot at getting out of this? They have a reasonable set of fixtures to finish, and although handicapped by being bottom they could do it, right? Hmm… Burnley are consistent. They have scored a similar average of points against the top seven as they have the rest of the league (0.7 to 0.8 per game). The problem here is it suggests that they are unlikely to suddenly launch themselves forward due to “easier” fixtures. And this similarity in rate has probably fed into the wider perception. In acquitting themselves adequately against better opposition, they’ve appeared better than they are. Sadly, these league low points numbers against the bottom thirteen are backed up by league low shot ratios and a league high deficit in conversion rate. It has been bad, it’s still bad, it hasn’t gone their way and they haven’t shown they have enough to save themselves. Which is sad because they are a breath of fresh air and Sean Dyche is alright and… aargh, stop, stop, STOP! Sorry, Burnley, it’s a tough old league. Fixtures: Two away games against top seven sides that they will definitely lose, two matches against holidaying teams and a six pointer against Leicester. Home to West Ham and Newcastle are about as kindly a two fixtures as you could ask for right now and that’s a good thing because they’ll do well to get any other points. Their record against the top seven is awful, they average minus 3.1 shots on target per game against them which is as dismal as you might expect. They also have achieved fewer points than any other team against them: one, from a draw at home to Man City. They will surely get nothing from the return trip to City and another to Liverpool. In their favour, against the bottom 13 teams, they are a recognizably par outfit. Their shot ratios are at 50% (TSR) and 48% (SoTR), it is just that they’ve had a hard time converting that into points, their average against this group is only 1.2 per game. Compare this to Swansea who have a similar shot profile yet are picking up 1.7 points per game here and suddenly they look a little unfortunate. Having played a game more than the teams above, they will need to hope for sleepy old West Ham and Newcastle to roll over and take a trip to Leicester with something to play for. It’s tough, they may not have sufficient fixtures to surpass others but their home form and record against lesser teams gives them slight hope. Reality: Woke up, smelt coffee, got some points. Fixtures: Two top seven sides, one holidaying team and three six pointers. There we have a variety of simple measures and we see Leicester are quite bad but not terminally so. They have sprouted into life buoyed by four consecutive games of out-shooting their opponents, which they’ve turned into three wins. The fixture list is mildly encouraging too given that they have six games, three will be defining and one is the ever-tempting “home to Newcastle”. Their record against the top seven is pretty bad (running theme here…) in fact only QPR and Hull are worse, but has been fuelled by a poor save percentage (60%) and of fixtures against the top seven, a home tie against Southampton is perhaps least daunting. In fact their chances of survival are less about the capabilities of themselves, moreso the possible inabilities of their rivals. The improved form they have shown over the last month has raised their underlying numbers to a level that relegation could even be described as undeserved. Whilst they are far from safe, it is straightforward to understand why the bookmakers are seeing their survival as more likely than the next two teams to discuss. Reality: It isn’t the referee’s fault. Hull have just been bad. Fixtures: Four top seven teams, a trip to Pardew’s Wonderland and a six pointer against Burnley. A touch of creative thinking is required to see Hull storming up the table. Newcastle are not a team that will visit soon, primarily because they came to Hull at the end of January and recorded one of only two league victories of 2015 and won 3-0. Ouch. Hull’s general problems are not that they are consistently bad in matches against their peers, they are broadly adequate here, it is that they have so few matches left against them. Their record against the top seven is awful, and four matches remain against such teams: teams they have failed to beat all year. They have managed under a goal a game against the top seven whilst conceding an average of two. 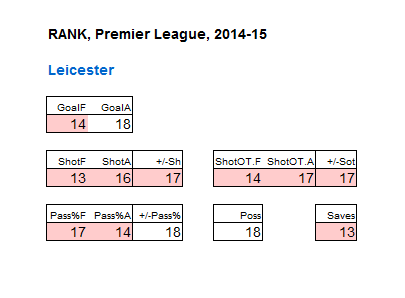 They create very few shots (c. 9 per game) whilst conceding a high volume (c. 15). On all the “semi-lucky” measures, they’ve haven’t even had semi-luck: 59% save rate, bad conversion for (9%), bad conversion against (13%). Fixtures: Three games against top seven teams plus away games at Stoke and Everton and crunch time versus Leicester. …and they promptly turned water into wine and proceeded to toast themselves back into the Premier League for another season. So, could it happen again? They are conceding so many shots and shots on target in these fixtures that they are effectively all but guaranteeing that they will not win. A sub-30% pair of shot ratios is the stuff of nightmares. 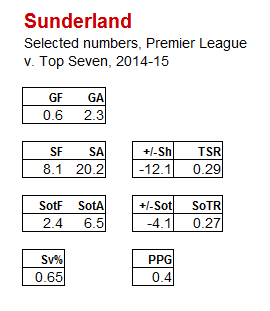 Their save percentage here, whilst not in itself terrible, is sub-par. They have only managed to beat Palace, Stoke, Newcastle twice and Burnley this year and look to have very little chance of gaining positive results from most of their forthcoming matches. The 1-4 defeat against Palace, coming so quickly after the 0-4 Villa loss was as indicative of a team on the precipice as you’re likely to see. 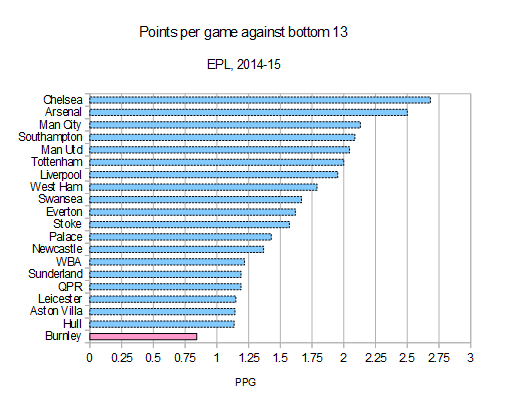 Is there any hope in the numbers against the bottom 13? Not a lot. They are really grindy, don’t take very many shots, which doesn’t translate into many goals or points. Ironically here, it is their save percentage that is helping them by running extremely high at 76%. This alone can be credited as the reason for which they haven’t lost as many games as you could reasonably expect and why despite a season of unsuccessful football, they still remain outside the bottom three. It can’t remain that way, can it? I’m being kind and giving Sherwood fuelled Villa a free pass here, maybe that’s too kind given tricky fixtures but as I explored last week, they’ve become a very different team under his tenure; their numbers are now largely par. Newcastle are a different story, a team who appear to have mastered the trick of getting just enough points before calling stumps; they’ve likely done all they need or will. Pulis has hauled West Brom clear and so we’re left with the five teams discussed. I believe that if Sunderland survive once more, they will be probably the worst team to have stayed up since, well, last year’s Sunderland team. So much of their season has has been represented by dour, unenlightening play, one can easily be drawn to the pluck of Leicester or the frivolity of QPR as preferred ingredients for next year’s league soup. Nor would I particularly miss Hull’s brand of football. They have improved slightly over time but have spent large swathes of the season posting inadequate numbers and if either of these two survives, as seems quite likely, major remedial work will be needed on their squads going forward. The potential is lacking for now and the league will not stand still. The bookies say QPR and Burnley are all but gone and one of Hull or Sunderland but in truth none of these teams will finish the season with any solid claims for retaining their place. One of these managers is going to find himself sitting in his office at about 6pm on the 24th of May, disheveled and weary, unable to believe his luck. And luck will likely contribute. With so few games to play, these teams need to catch a couple of breaks and as we saw with Sunderland’s Lazarus turn last year, relegation is never certain until the trap door opens.